The Fellowship was fortunate enough to obtain a copy of MARS ATTACKS #1 from IDW Publishing. The story is by John Layman with art by John McCrea. Flashback to the summer of 1961 – a Martian ship has crashed on Earth after accidently hitting a Mercury Blackrock Orbiter. Two men come across the crash site and grab one of the Martians (named Zar) to sell to the carnival as a sideshow. Zar is beaten and abused until one of the men that found him had a change of heart and tries to free him. Zar’s shipmates show up and a battle begins. Zar escapes to the saucer and activates an emergency beacon. Fast forward 25 years later as General Zar returns…with an invasion force. I wasn’t sure how this book would be handled. If you are expecting the campiness of the movie, you are out of luck. This book is played straight and very well written. 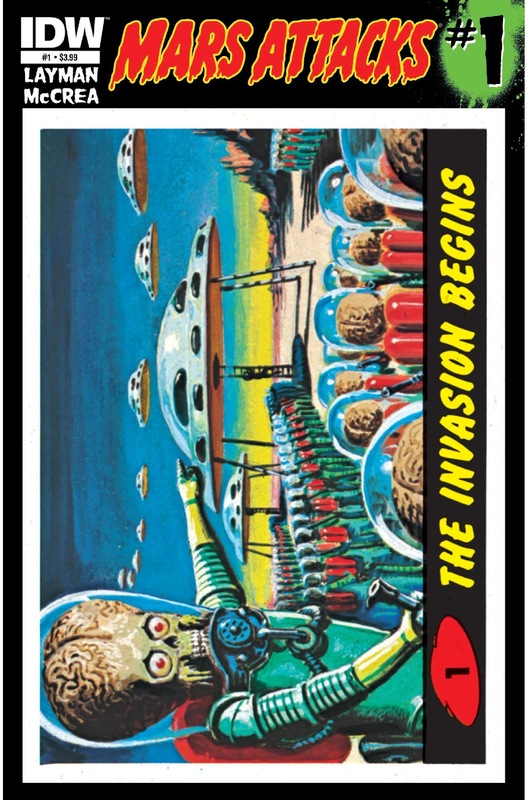 I don’t know if the classic card set ever gave a reason for Mars invasion in the first place, but revenge as is always a good one. I remember John McCrea’s work best from DC's HITMAN series and does a great job here. There is a realism to his depiction of the Martians on most pages (or as real as something like that can be). This has the potential of being a real good series. MARS ATTACKS #1 is in comic stores and available at www.idwpublishing.com.